Criticize their dress, or the construction of mosques in your community, or the teaching of Islam in your schools, and you are an Islamophobe. The report was published just five years before airliners hijacked by Muslims slammed into the Twin Towers. Labels are weapons, and the word Islamophobe is an aggressive substitute—at least for now—for the sword. It is a publicly administered bludgeon, a cream pie to the face, intended to suppress not just critical discussion of Islam, but criticism period. Many of the victims fall into the trap of defending themselves to prove they are not bigots or racists that the label is intended to imply. Take the example of British author and playwright Stephan Fry. He got the cream pie for defending the atheist and evolutionary biologist Richard Dawkins, who got himself branded as an Islamophobe for his outspoken views on Islam. Fry spent a lot of time giving interviews that he did not hate Muslims. That’s the intent. Turn the tables. Put your critic on the defensive. The Left aids and abets this, but with the Left it is the result of ignorance or willful blindness toward what Islam really is. With Muslims, it’s a different matter. With them, slinging labels is a counter-phobic reaction, a fear reaction. 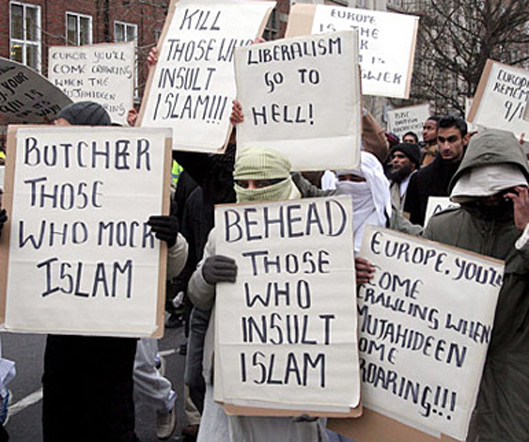 They fear that if you probe deeply into Islam you will learn what they really believe, giving you a sword to use against them, and attack words like Islamophobia are intended to keep you from looking too closely. What they believe is so outrageously outrageous that it has enormous mockery potential. They know this. They live in fear of the informed sneer and the joke that cuts to the heart of it. That is the purpose of throwing out a label like Islamophobia. It is a warning, the shot across the bow that says, “Come no closer.” Which is exactly the reason you should take a close look at what they believe. Try these as samplers: Why, for example, do Muslims touch or bang their heads on the ground during the prostration prayers that symbolize Islam? 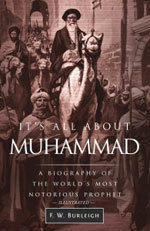 Why do they say “Peace be upon him” at every mention of the name Muhammad or his title: “Messenger of God”? 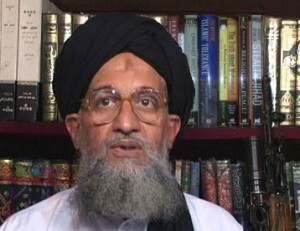 Note the bruise and the scar on the forehead of Ayman al-Zawahiri, co-founder with Osama bin Laden of al-Qaeda and now its leader. This is what fear of hellfire will do to your forehead if you are a fervent Muslim and routinely bang your head on the ground in prayer. 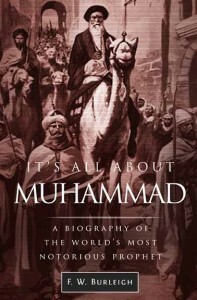 Here’s the close look that Muslims do not want you to take: Muhammad’s only originality lay in inserting himself into the concepts of other people’s religions and making himself the hero of the story. 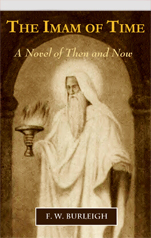 He cast himself as the interface between God and man. He got his ideas about the afterlife from Christianity and Judaism and loaded his Koran verses with visions of cruel, sadistic torments in hell—so frightening they were the inspiration for Dante’s hell imagery. Hell is central to the system of control Muhammad created. Muslims are raised to dread hellfire. They pray fervently to gain credits with Allah to spare them, and the most fervent among them—meaning the most fearful of hellfire—develop permanent bruises and scarring on their foreheads from all the head-knocking. The badge of piety; the mark of fear. Fundamentalist Christians also fear hellfire, but here’s the kicker: Muhammad gave his followers a way out of hell in the event they ended up being thrown into the flaming pit after getting their bodies back on the Day of Resurrection. He, Muhammad, would personally intercede for them with Allah to get them released! But there were strings attached: They had to continually make mention of him during their prayers and pray for Allah to give him intercession rights over them. And they must continually ask Allah to bless Muhammad for this role, which is the reason they say “May peace be upon him” at every mention of his name. With each prayer, with each utterance of “Peace be upon him,” the believers believe they rack up points with Allah and Muhammad both. It’s like an insurance policy. 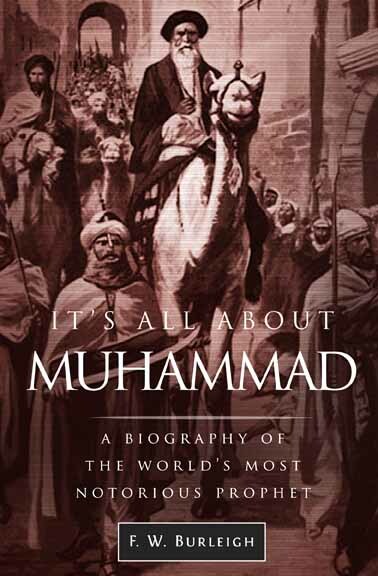 The more they make mention of Muhammad, the more likely Muhammad will remember them on the Day of Judgment and petition Allah on their behalf to spring them from hellfire and allow them into paradise. Beyond belief, unless of course you are a Muslim. There is a lot more such nonsense to Islam. This only scratches the surface. himself. Accept him as the messenger of God and intercessor on the Last Day or else! That was his message to the Arabs of his day and age as he and his followers slashed their way across the land. The Arabs preferred to live and so they submitted to him. Islam has gone through cycles of bloody expansion for 14 centuries, imposing itself through terror, and it is now gearing up for another vicious cycle. Muslims overwhelmingly approve of its expansion because they have been brainwashed into believing Muhammad’s nonsense about himself and that what he created should dominate the world. In Muslim countries, you will not hear of people being branded as Islamophobes because for the non-Muslim in those countries, it’s already over. They’ve already been killed, forced into servitude, or they have fled. It is used only in countries where Islam is weak in numbers, as it still is in the West. Where they are weak Muslims are vulnerable to scrutiny. The nonsense of what they believe offers tremendous opportunities for ridicule. Muslims fear this and that is why in the West they scream Islamophobia at every opportunity. They want to keep you from looking too closely. They are the phobes. They fear your ridicule, they dread your scorn. Maybe you should give them what they fear.